The Dwarves and Bilbo stay at Rivendell with the elves. 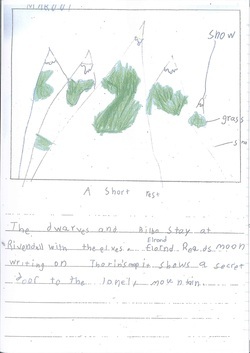 Elrond reads moon writing on Thorin's map. It shows a secret door to the Lonely Mountain where the dragon lives. 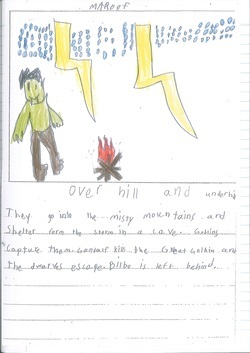 They go into the Misty Mountains and shelter from the storm in a cave. Goblins capture them. Gandalf kills the Great goblin and the dwarves escape. Bilbo is left behind.